Gaodetec is one of China's leading mud pump supplier. 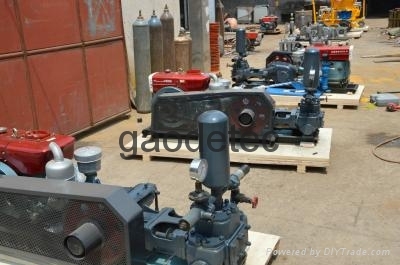 Gaodetec has tens types mud pump for option. According to engine difference, Gaodetec mud pump has electric motor drive, Gaodetec mud pump motor drive, diesel engine driven, the choice of the hydraulic motor drive. According to the flow rate and pressure difference, Gaodetec mud pump high pressure low flow and low pressure flow of choice. What is the application of slurry pump? Gaodetec mud pump flow from 150 l/min to 850 l/min is bigger, the mud pump can be used to drill or rig used in mining, geological drilling, coal mining, railway, highway, water conservancy, water and electricity, such as Bridges, high-rise buildings, foundation reinforcement project. 1. What project you will use what is the role of mud pump? 2. The flow and pressure of what do you want? 3. Engine, you want to mud pump motor or diesel engine or motor?